KIT won an Oregon Book Award! Winner winner, avocado-toast dinner!! (It was Portland after all). THE TRAGICALLY TRUE ADVENTURES OF KIT DONOVAN won an Oregon Book Award! Specifically the ELOISE JARVIS MCGRAW AWARD FOR CHILDREN’S LITERATURE. (Want to learn more about Eloise Jarvis McGraw?Just click here). I’m still stunned, but mostly I’m incredibly grateful. The day to day of writing is mostly a solitary thing, but the the job of getting a book out into the world requires a lot of support. I’m so grateful for my friends, my family, my agent, and my editor who all helped me write a book that people enjoy. It really does take a village. I only hope I give as good as I get. I shared a lot of thanks in my speech that night – a speech I never imagined I’d have to give. I thought I’d share it here on my blog, too, for those of you who didn’t make it to the awards ceremony. *Note: this may not perfectly match the deer-in-the-headlights, stammering speech I actually delivered in a state of shock that night. 🙂 But it’s pretty close to what I hope I said. “I really didn’t expect it could get any better than seeing my little book on a list with so many authors whose work I enjoy and admire. To my fellow Children’s Lit. Finalists: Kurt, Diane, Elizabeth, and Cynthia – your work is everything that is wonderful in kidlit. I’m honored to be in your company tonight. First Literary Arts. You championed this book far longer than you might know. First, with your Author Tours that brought workshops led by real life authors to my little town on the other end of the state. Then with a generous fellowship that helped me revise my story into something an incredible agent and later an editor would want. And now this. I can’t even begin to express how truly grateful I am. Second, I’d like to thank our glorious community of Oregon Authors. I don’t know what writers are like everywhere else, but writers in Oregon are amazing. *Hardworking, talented, kind, and incredibly generous and supportive. I’m forever grateful to you for letting me into your organizations, for answering my emails and posts with grace and kindness, and for being so danged inspiring. It’s an honor to be part of your community and a gift that I get to call so many of you friends. And finally I’d like to thank my husband John who believed in this book from the beginning – and who does all the really hard stuff – like cooking dinner and navigating Portland traffic. None of this happens without you. *I may have said freaking amazing at the event – because they really are. It was a pretty spectacular evening spent with pretty spectacular people. 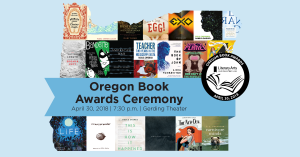 You can read about the other Oregon Book Award winners at Oregon Live and check out the other finalists in the Children’s Book category here. Thanks again to Literary Arts! You made my year.